Water removal services are essential for anyone who has had a significant water leak in their home. The laundry room inside your home can be struck with significant water damage when your washer begins to gush water. A water-supply line can become detached and began to flood the carpeted room with water at a quick pace. By the time you noticed, the water has covered the floor, and it is beginning to leak into the rest of your home. Turning off the water in your home is essential at this point, but you can't call a plumber right away, if there is too much water. It is imperative for you to call for a Westmoreland based water removal service as fast as possible. Getting professionals onto the scene to remove the excess water allows you to get an appliance service expert in faster. Until the water-supply line is fixed, you can't turn the water back on, or else the problem can begin all over again. When you reach out to SERVPRO of Greensburg, we make an effort to travel to your home as quickly as possible because we understand how stressful the situation is. Once we arrive, we can launch right into removing the excess water from your home. At SERVPRO, we use advanced trade technology to do our jobs, ensuring that qualified technicians and proper equipment restore your home. We use industrial-quality wet/dry vacuums to remove the water as fast as possible. SERVPRO uses these particular devices because they can remove large volumes of water swiftly. If the volume of water is significant enough, we can even bring truck-mounted tools to do the job. After removing the majority of the water from your laundry room, SERVPRO can use extractors on your carpeted floor. Extractors are like wet/dry vacuums but designed for drying carpets, upholstery, and drapes. A heating element warms the fabric as it pulls moisture from it, drying it as it extracts water. Once the water has been adequately cleaned up, SERVPRO will place the proper drying equipment and monitor until all affected areas are dry. When water damage strikes your home, always get help right away. Get in touch with SERVPRO of Greensburg by phoning (724)837-8830. Our techs are always prepared to help as soon as possible. Need to pass a home inspection? Your sellers may have trouble spots to address before you list a property or schedule an inspection. The clients may choose to handle these issues themselves to avoid filing an insurance claim for the damage because it may not be covered by their policy and can affect the home's CLUE report. CLUE (Comprehensive Loss Underwriting Exchange) is a database which records reported loss and damage information, and it is utilized by most insurance companies. Unfavorable CLUE reports can lead to increased premiums and policy renewal issues for property owners. Whether the problem is a water stain on a hardwood floor or a mildew smell in the basement, reassure your clients that your SERVPRO of Greensburg Professional can get their home in top show condition and ready to sell. The first 48 hours after fire damage can make the difference between restoring versus replacing your property and personal belongings. SERVPRO of Greensburg professionals can help prevent fire damage from creating long-term problems, providing timely response to fire, smoke and soot removal, to content claims inventory, and document restoration. These services help insure your property, belongings and memories are restored to pre-loss condition when possible. So after the first wave of heroes have rescued the property, let your SERVPRO of Greensburg professionals help you restore it. With industry approved training, rapid response times, cutting edge technology, professionalism and open communication, we strive to restore not only your home, but your peace of mind as well. To demonstrate SERVPRO's dedication to helping prevent fire disasters, we have partnered with the American Red Cross Smoke Alarm Initiative. SERVPRO of Greensburg, along with other local partners such as Westmoreland Community Action, will conduct free, in-home fire safety checks and install smoke alarms at no charge for families who qualify. Statistics show that working smoke alarms save lives and reduce injuries and property damage due to home fires. 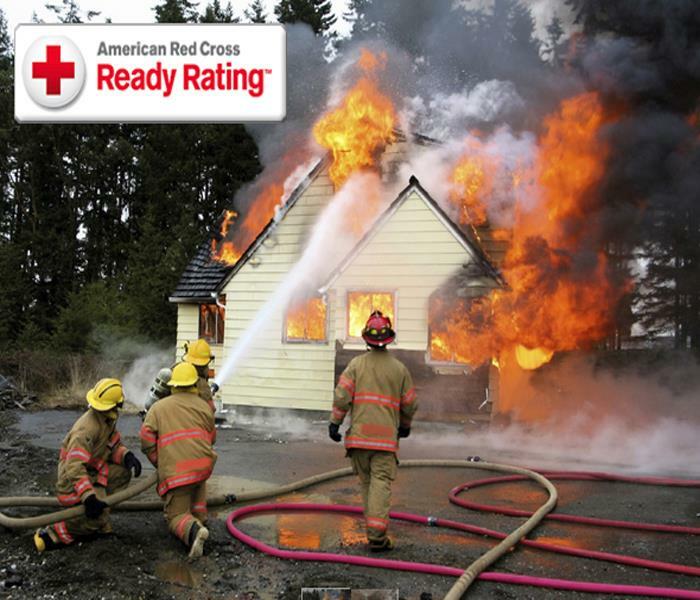 The American Red Cross launched this nationwide campaign to reduce the number of deaths, injuries and damage to homes by 25% in the next five years. SERVPRO of Greensburg is proud to be a part of this Home Fire Preparedness Campaign. Does your home or business need a deep spring cleaning? We have the services to get the Winter YUCK out of your home or business! Clean you gutters and repair if sagging occurs. Direct downspouts 5-10 ft. away from the house. Inspect your gutters' capacity - after 15 min. of heavy rain, if water overflows the gutters, install additional downspouts. Repair any noticeable dripping pipes & check for dark spots under pipes and on ceilings. Inspect the roof for missing, lose or damaged shingles. 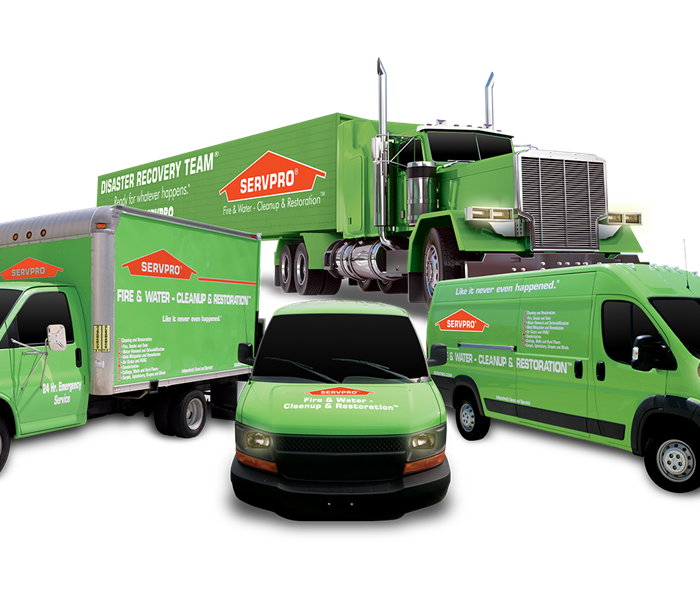 Did you know that SERVPRO of Greensburg is not just a restoration company? From Carpets to Catastrophes......we also provide the cleaning services that you would not think the BIG GREEN restoration team does. 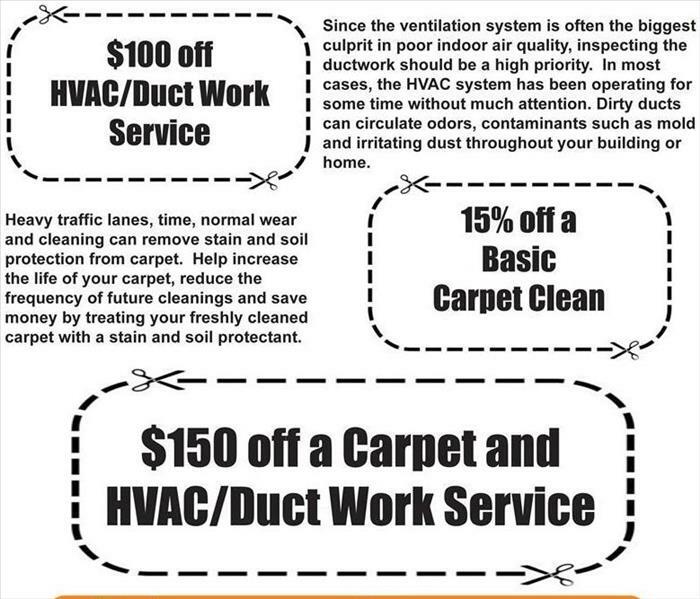 AIR DUCT AND HVAC CLEANING - Franchise Professionals can inspect your HVAC system and ductwork. Cleaning services can be provided to help restore peak energy efficiency, eliminate offensive odors and improve indoor air quality. CARPET AND HARD FLOOR CLEANING AND CARE - Franchise professionals use the latest IICRC training as well as state-of-the-art equipment to remove entrapped soils from deep within your carpet's pile and backings. STAIN REMOVAL & STAIN RESISTANCE APPLICATIONS - Using IICRC standards for carpet as a guide, Franchise Professionals will show you what cleaning option would be best for your carpet's level of soiling and explain the benefits of soil protection. ODOR IDENTIFICATION AND DEODORIZATION - Franchise Professionals will find the source of the odor and determine the best method to neutralize and eliminate it. UPHOLSTERY AND DRAPES: WET OR DRY CLEANING METHODS - Fabrics are inspected and tested to determine the safest and most effective cleaning method. When you turn on your furnace, did you ever get black particles coming from your vents? That is called a PUFFBACK. PUFFBACKS can arise when a furnace or oil burner malfunctions....oil is ignited and an "explosion" in the fire box occurs. Be careful, cautious and call SERVPRO OF GREENSBURG. We will clean damaged homes, businesses and contents. Contents include furniture, blinds, carpets and more! Frozen pipe leaking after it bursts! Every winter season, the pipes in your business and home are at risk of damage from freezing conditions. 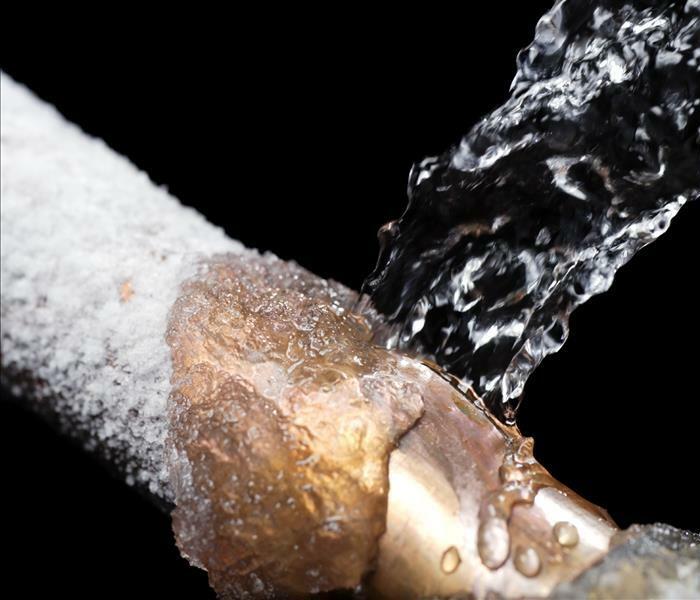 Low temperatures can cause your water pipes to freeze, and in some cases burst. The following tips can help you safeguard your home before, during and after a pipe freezes. IF YOUR PIPES STILL FREEZE AND BURST, CALL SERVPRO OF GREENSBURG AND YOUR INSURANCE AGENT FOR IMMEDIATE SERVICE!! 3/27/2017 - Need to sell a home FAST? 4/18/2016 - Does your home or business need a deep spring cleaning? 2/16/2016 - Did you know that SERVPRO of Greensburg is not just a restoration company? 1/29/2016 - What is a PUFFBACK?